When I saw this linkup I couldn't resist! I know I already posted about a similar topic today, but as mentioned in my other post I absolutely love using trade books to reinforce and teach concepts. In my life science unit we study ecosystems, food chains, food webs, and so on. When I stumbled across the book Will We Miss Them? I knew exactly how I would use it in my unit. 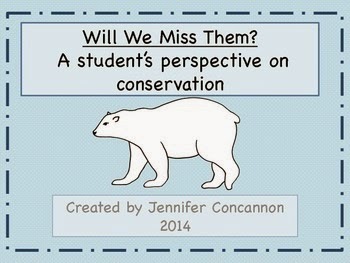 I had the students create a postcard about an endangered animal of their choice. My word to describe the book was inspiring. I chose that word because it was written by an 11 year old girl, which is around the age of my students. The story highlights the threats that endangered animals face and the illustrations are beautiful! I have not done this unit yet with my students this year, but in previous years we read the story aloud. The students were then to research an endangered animal of their choice for homework. The following day in class they pulled facts from their research to use in their writing pieces. Each child was given a large flash card to create their postcards. The front had to contain a drawing of the animal and the back included facts and ways to help save the species. 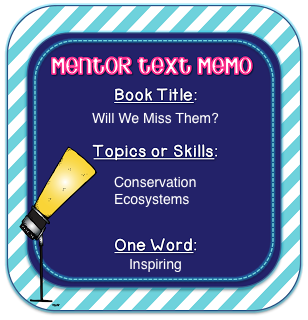 I created this freebie to go along with the book at my TPT store. To get the product click on the picture below.